The consumer journey is experiencing radical changes as behaviours shift with developing mobile technologies. With these changes come challenges. Cart abandonment rate is a colossal challenge, which, at times, is ignored. The truth of the matter is that cart abandonment equals a tremendous amount of lost eCommerce sales, so it’s an area that every company needs to overcome. The process a consumer takes before purchasing online has changed dramatically. It’s no longer a case of identifying a need, information gathering, finding, and then buying. The overall journey is convoluted and the steps a consumer takes before purchasing are far removed from the predictable pathway of the past. Moreover, multi-step eCommerce journeys across multi-channels increase funnel abandonments and eventually, decrease revenue growth. Imagine a situation where your ideal customer found your product while browsing on their mobile, they then wanted their friend’s opinion so they opened a messenger app window. After asking for their friend’s opinion, their conversation changed, the consumer became distracted and lost their intent purchase. There could be multiple cases like these and if you let your customer forget about you so easily, you are leaving monstrous amounts of money to the wind. Baymard did a thorough analysis of 34 sources which came out with cart abandonment numbers in the eCommerce industry. According to their findings, an average of 68.8% shoppers abandoned their carts. Again – that’s a lot of revenue! Why Are Cart Abandonment Rates So High? Following further analysis, Baymard found that there were multiple reasons that made people quit. The graph below outlines the key reasons for cart abandonment. 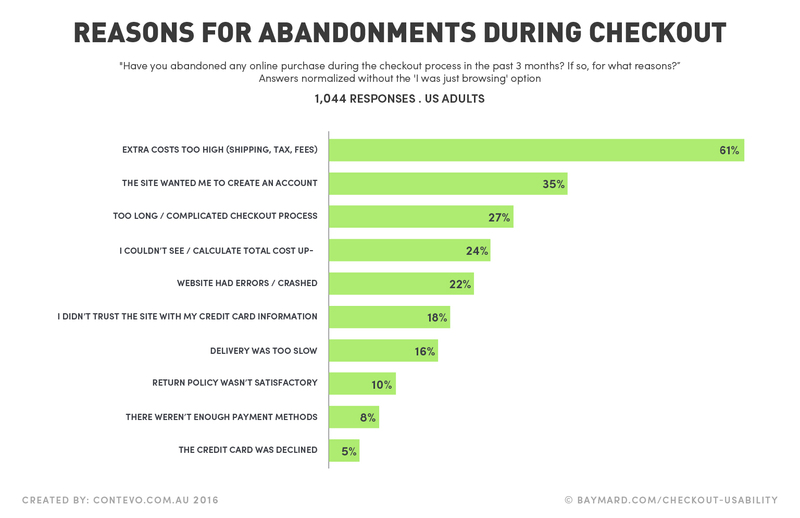 As you can see, some of the top reasons include high shipping fee, complicated checkout processes (could be solved with better UX) and account creation requirements (which could be solved by adding a guest checkout). Segment people on the behaviour they performed on your website. Target them with customised marketing messages based on their behaviour. Boost your conversion rate and increase your marketing ROI. Remarketing on Facebook is a strategy many companies implement in order to target users who have previously visited your site. Using browser cookies, we can create highly relevant advertisements based on the behaviour they exhibited on your site. 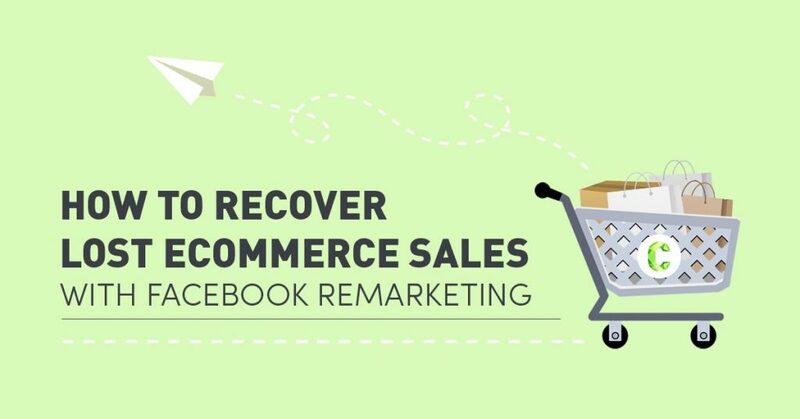 For an eCommerce store, Facebook remarketing ads can help you identify user behaviour while they shop on the site and target them based on actions they took. Why does Facebook remarketing work? According to this study by Adroll , B2B marketers increased their retargeting budget by 51% and retail companies by 26% in 2015. Why are companies investing more into remarketing? The answer lies in the fact that you can segment people and send them targeted messages which will convert to more purchases. For example, you can track everyone who abandoned your cart in the last 30 days and pitch them with an exclusive coupon code or free shipping on the product they chose earlier. If you’d like to know more about remarketing, here are 10 interesting stats from Wishpond. 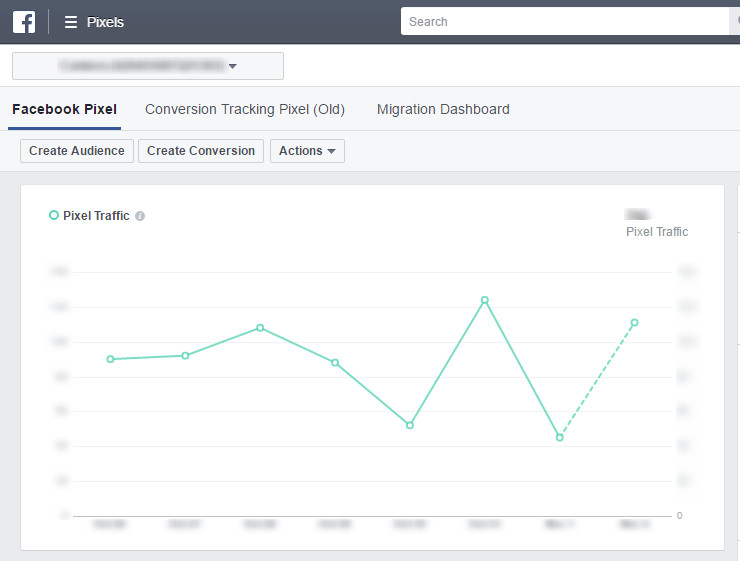 Using Google Analytics and Facebook Ads, you can understand where people drop off on your website. In the above example, people drop off at the cart and checkout page. With Facebook advertising, we can directly target those who abandoned their items at these points. In this case, men between the age of 18 to 35 are more likely to convert than any other set. This would mean that those who abandon their carts are remarketing cart abandoners who are men between the age of 18 to 34 would make a good audience. Based on different conversion steps and journeys, you can segment your audience into multiple groups. In the above example, we talked about people who are abandoning at the cart and checkout stage. However, on a broader level, you can target audiences in the following fashion. Customer Lists refer to a list of your existing customer information. As an eCommerce store, the email addresses of your customers are one of your biggest assets. You can now upload the list and use it to specifically target only your existing customers. Website traffic refers to segmenting people based on their activity on your website. In the given example, you can segment people as cart abandoners, checkout abandoners and successful orders. App activity is similar to website traffic segmentation. You can divide users based on actions they took while using your app. 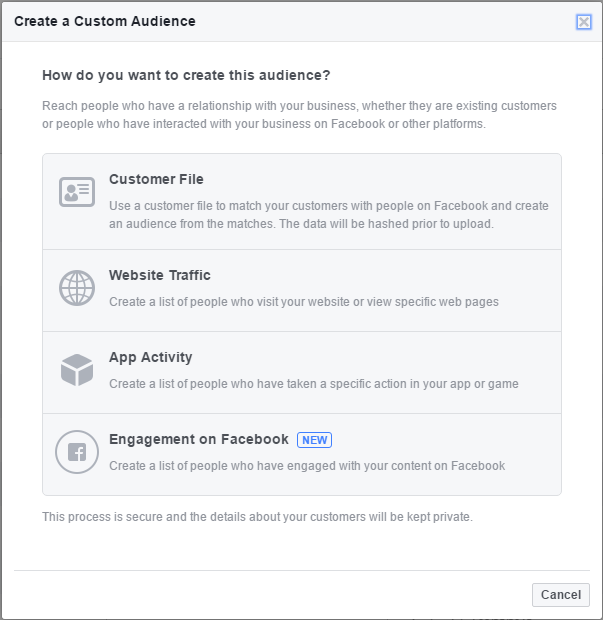 Engagement on Facebook lets you target everyone who interacted with your Facebook posts. This gives advertisers an opportunity to target people who have shown interest in the page activity and might be potential customers. You need to first setup a facebook tracking pixel on every page of your website and then create custom audiences. 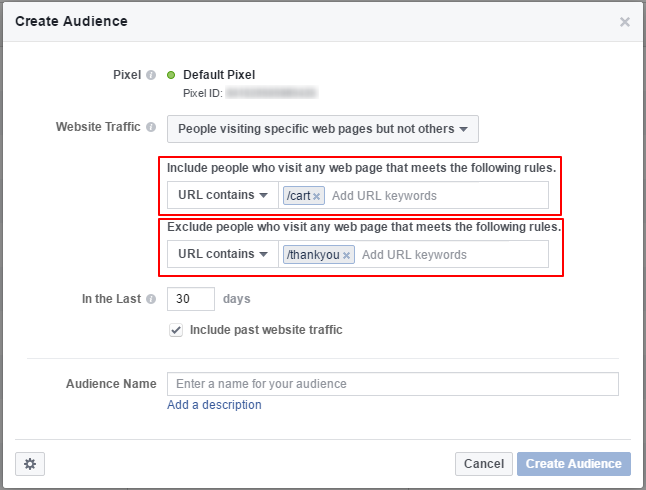 To create a list of cart abandoners, you need to create a new Facebook audience using the “Website Traffic” objective. By including people who completed purchase behaviour right up to the cart page but did not actually complete a sale (I.e ‘thank you’ or ‘checkout complete’ page), you now have a cart abandonment audience. Cart abandoners don’t purchase because they were simply not ready to purchase or they may want to compare other websites to get a better deal. Cart abandoners may not have purchased if they thought that the shipping price was too high. Dynamic product ads: For scenario 1, these are ads where the user sees the same products which they abandoned from the website now in their Facebook feed to prompt them to return to purchase. Creative template ads: For scenario 2, you could create a static image ad which offered a free shipping coupon to be used within the next 24 hours. We recommend that you test both the ad styles and then assess and compare the performance of both. 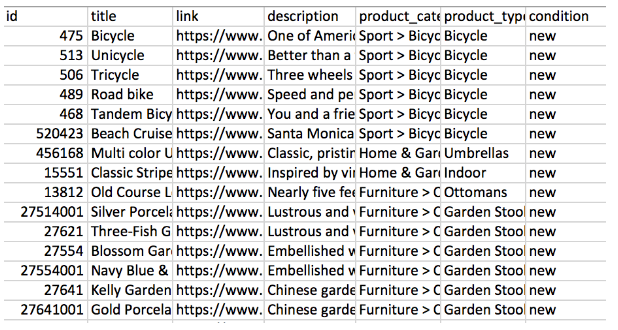 Setting up dynamic ads: You need to get started with building a product catalogue in an XML or CSV file and integrating that with your pixel. Next, you need to set an ad template in which your ads would be displayed. This detailed guide illustrates how to implement dynamic ads. Setting up and running your ads is the first half of the process. You then need to constantly be monitoring KPI’s that matter and always be optimising your ads further to maximise your ROI. In the above snap, you can see that the 3rd campaign is doing best in terms of purchases, cost per click and cost per acquisition. This means that we can increase our spend in this campaign and decrease in the non-performing ones. Let’s see how we can optimise this further. In the given example, the cost per acquisition for Ad 1 is $2.71, however for the other ad, the cost of acquisition is 7x more. It makes sense to pause the second ad here. Visual appeal and text play a big role in influencing click through rates. The more appealing the ad is, the better people will interact with your content. As a process, you should optimise your ads every 48 hours to reduce your cost of acquisition. While running Facebook remarketing ads, your customers will get bored easily if you keep serving them the same content over and over again. You need to set up your remarketing ads with fresh content (static ads) every 5 to 7 days in order to keep people engaged. When you couple this with regular testing and analytics, the chances of your campaign becoming successful are much higher. Understand the different conversion steps before someone buys from your store. Setup Facebook pixel on all pages. Segment your audience base on the different steps they take. Setup dynamic ads to serve people the products which they abandoned. Setup static ads with custom messages for people stuck at different parts of the funnel. Analyse and optimise your ads every 48 hours. 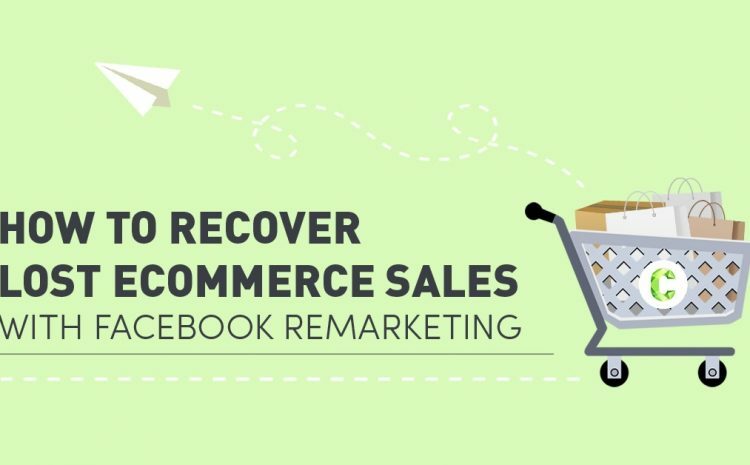 Need help to recover lost eCommerce sales? We can help get you started with Facebook advertising.